JYJ’s ‘Found You’, the OST for KBS 2TV’s ‘SungKyunKwan Scandal’, has been chosen as the Seoul Drama Awards’ ‘most popular drama OST’. According to the Seoul Drama Awards(SDA) on the 20th, ‘Found You’ came out on top with 19,071 votes in the ‘Seoul Drama Awards 2011 Popular Drama OST’ online poll that was held from June 29th till July 20th on Cyworld. ‘Found You’ is a love song that talks about finding the love of one’s life and has been praised for tapping into emotions with flowing melodies and voices. The song became a hot topic amongst fans as it combined the voices of Park Yoochun, Kim Jaejoong and Kim Junsu. ‘Found You’ was followed by ‘That Man’ by Hyun Bin in SBS’ ‘Secret Garden’ with 15,646 votes while Yang Yo Seop’s ‘I Care for that Person’ from MBC’s ‘My Princess’ came in at third with 9,930 votes. Meanwhile, the 2011 Seoul Drama Awards will showcase a competitive battle between 204 productions from 37 countries with the catchphrase ‘Drama Road’. Contrary to last year’s awards, awards will be given out in seven categories that include the Best Drama, the Second Best Drama and the ‘Best Theme’. The awards ceremony will take place on August 31st at the KBS Hall in Yeoido. Yoochun in “SungKyunKwan Scandal vs Miss Ripley”: How much has he matured? 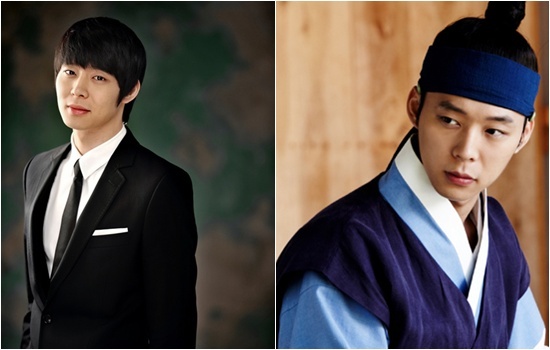 110626 Park Yoochun “SungKyunKwan Scandal vs Miss Ripley”- How Much Has He Matured? Actor Park Yoochun, in his second acting challenge, has been praised for showing a charm and maturity in his acting that differs from his first drama. 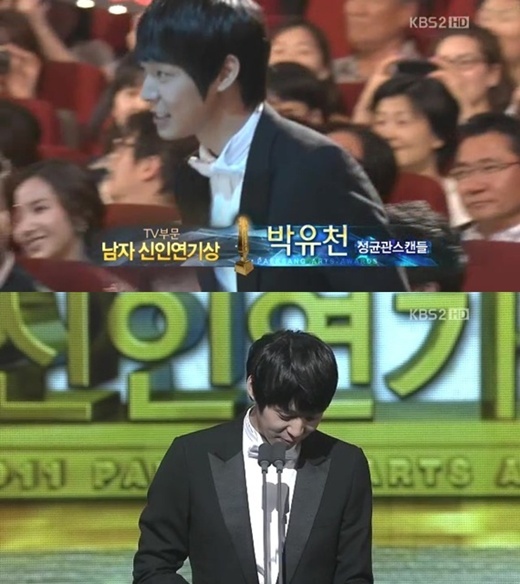 Park Yoochun announced his entrance into the acting world via last year’s KBS drama “SungKyunKwan Scandal,” and recently returned as “Song Yoo Hyun” the gentle conglomerate heir in MBC’s Monday-Tuesday drama “Miss Ripley.” In his previous role he played a rigid and critical “pretty rich boy,” and swept the KBS Drama Awards ‘ newcomer award as well as the best newcomer and popularity awards at the 47th Baeksang Art Awards, successfully debuting as an actor. 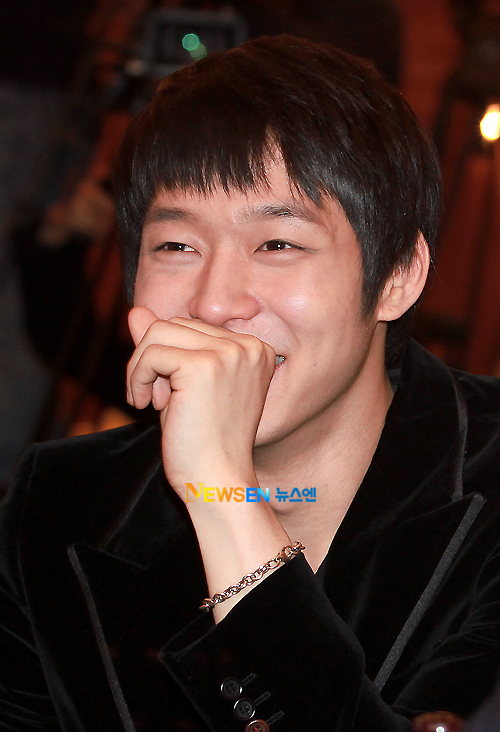 As a singer, Park Yoochun is one of the representative Korean idols, and now he puts his all into acting. After “SungKyunKwan Scandal,” he received numerous good scripts and acting invites but deliberated carefully before picking his next project. Despite being busy with group activities, he found time to study acting and undergo training. 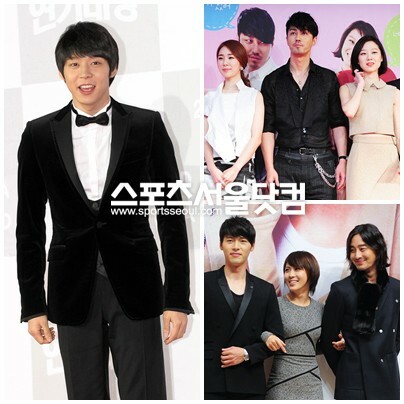 Therefore, the actor Park Yoochun in “Miss Ripley” has a more mature and seasoned feel. As a rookie actor challenging drama for the first time in “SungKyunKwan Scandal,” Park Yoochun had already received reviews beyond expectations. In short, he “has great potential.” He brought life into the role of Lee Seon Joon, who was born into a rich family, a rigid man who possesses knowledge, manners and is talented in all fields, yet is confused when facing love for the first time. With a blend of gentle expressions and controlled acting, Park Yoochun successfully interpreted the process of growth and maturity in the critical young man. The audiences and even professionals gave him good reviews. He managed to get not one but two top acting awards for newcomers with his debut work. Furthermore, in the recent “Miss Ripley,” Park Yoochun plays a charming but firm young man, which is similar to his previous role, but is interpreted perfectly as a distinctly different character. No longer strict, a friendly Park Yoochun displays a gentlemanliness and warmth towards everyone he meets. However, a cloud of mysterious sadness plagues him. His actions show his concern towards his wealthy background as well as the memories of his birth mother. In a sense, when “Miss Ripley’s” Song Yoo Hyun (Park Yoochun) is compared to Lee Seon Joon in “SungKyunKwan Scandal,” his character seems more complex. Especially in the later part of the drama when Song Yoo Hyun finds out the true identity of Jang Miri whom he loves, the change in his emotions should be one of raw misery. At the crossroads where his fate hangs in a balance, how Song Yoo Hyun’s complex yet subtle emotional changes will be executed is something that people are looking forward to. Entering into the world of acting through “SungKyunKwan Scandal,” whether Park Yoochun will be able to once again successfully perform with “Miss Ripley” is something to look out for. ◆The Best Drama, “Idol With Best Acting Skills” is? JYJ’s Park Yoochun(25) who is currently active in MBC’s Drama “Miss Ripley” beat the other idol singers at the polls and has been awarded the position of “Idol With Best Acting Skills.” Park Yoochun challenged for the first time in last year’s KBS2 drama “Sungkyunkywan Scandal” and received good reviews. In his first attempt at modern-day dramas, he captured the attention of the viewers with his calm voice and gentlemanly appearance, together with his execution of crying scenes that surpasses his rookie status. Fellow acting idols have rated Park Yoochun, who is currently still passionately acting in “Miss Ripley,” as having “progressed to a higher level (of acting. )” Other reviews say that “After two dramas, he cements his place as an actor,” “His stable and calm breathing is well executed,” “He understands and expresses his role very well” and other positive comments. While after his another winning for popularity award, Park Yoochun preached his gratitude for his fellow JYJ members and fans, “After getting hurt, I become even more tougher,” he said the meaningful inner thoughts of him. The ’2011 Baeksang Arts Award’ is celebrating its 47th anniversary this year, being launched for the first time in 1965, it’s been an event to award all those active producers and actors for both movie and TV sector throughout the year with 15 award categories for TV section and 11 categories for movies. Without fail, he is the famous Hallyu Wave Star in Japan. JYJ’s member, Park Yoochun who participated in MBC’s New Drama, ‘Ripley’ will be broadcasting in Japan. From previous year, KBS Drama ‘Sungkyunkwan Scandal’, to ‘Ripley,’ the reason of “Park Yoochun is the lead” is the key to sell in Japan. Similarly, Park Yoochun debut piece, Sungkyunkwan Scandal,’ was competitively sold in Japan last year for a costly price of (approximately 30 billion won). Using 20-episode ‘Sungkyunkwan Scandal’ as a guide, 16-episode ‘Ripley’ may cost about 25 billion won. ‘Ripley’ will be broadcasted on 30th May after ‘The Duo’. “SKKS” gathers great popularity in Japan – Breaks record for most rentals in five days! KBS 2TV drama “SKK Scandal,” which ended last year, is also gaining great popularity in Japan. “SKK Scandal” started DVD rentals last month on the 20th through Japan’s largest DVD/CD rental and selling company “TSUTAYA” and broke the record [for most rentals] in five days. This is 230% more than the rentals for “You’re Beautiful,” which was greatly popular last year in Japan. Furthermore, “SKK Scandal” Complete Edition DVDs 1-10 took the top 10 rankings for itself in TSUTAYA DVD Rental’s Asia TV Weekly Ranking (April 18th-24th). Also, in Japan Tokyo Roppongi, a costume exhibit in celebration of “SKK Scandal’s” popularity will also be held. In this costume exhibit, Park Yuchun, Park Minyoung, Song Joongki, and Yoo Ah-in’s costumes from the drama will be displayed. Furthermore, “SKK Scandal’s” theater version will open on the 6th until the 19th at Warner Michael Cinemas.